In Which I Think I’ve Eaten Too Many Stars. I Mean Sugar. Lately, (psh, lately? How about for the last four years?) I seem to spend all of my time online. Mainly twitter, which is where you can usually find me. So when do I ever have time to draw? I have no answer for you, though I miss it. For awhile, a friend of mine and I tried to motivate each other by doing weekly drawing challenges, but it kind of fizzled out because life got in the way. I haven’t given up on it yet though. I will persist. Ahem. I have managed to get a few sketches out though, and while I don’t think they’re that good, they’re at least getting me into the drawing mindset. And the comic mindset as well. There’s some big motivation happening on The Family Menagerie front. It’s coming back. When? Not sure. But it’s coming. If Ash has anything to say about it. Which I’m sure she does. Though it might all be taking a back seat once we start D&D’ing next week. Oh right. Did you not know I was a nerd? Where was I? ART. Have some. 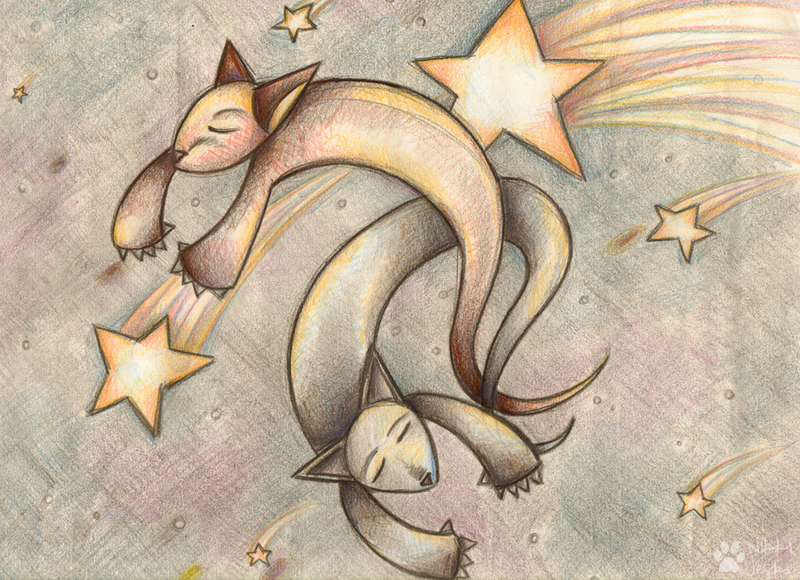 Sometimes we like to chase stars. And sometimes we like to eat them. They taste like sugar. No, really. Oh but I did mention sketches. Have some of those too. Because I like to draw things like hands, flying space Stegosauruses, shy moose, and Jackalopes in hats. I’m eclectic. Did you not know that? It’s been a Miyazaki kind of month and Studio Ghibli makes my heart happy. And because Ash and I are nerds and like to collect things like giant stuffed monsters and talking cats. If you haven’t ever seen a Studio Ghibli film, preferably Miyazaki, do yourself a favor and go out and rent one. Spirited Away, Princess Mononoke, Kiki’s Delivery Service… so many. Just go google them and pick one. They’re all amazing. 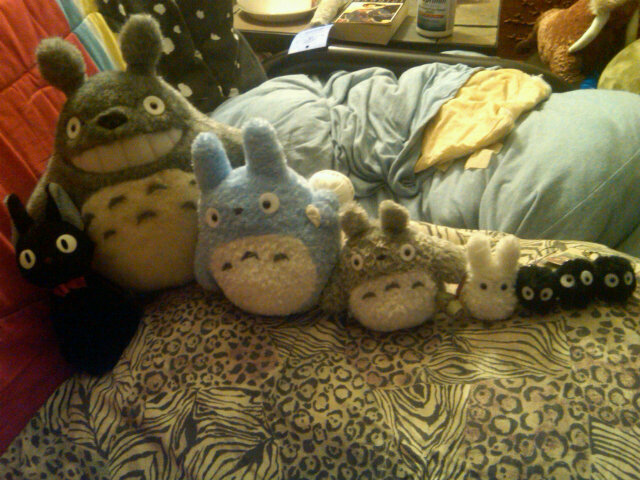 My Neighbor Totoro is a favorite in this house. Can you tell? Now your heart can be happy too. While I haven’t been updating here much, I still do blog over at Fuel your Illustration. Sometimes. Rondal is an amazing co-editor and I’m pretty sure FYI wouldn’t be anywhere if it weren’t for him. Thanks Rondal! Anyhoo, here are some of my recent contributions. We need rain here in Texas. Badly. That’s a picture from Big Dog Rescue’s Facebook page. They’re located in the Austin area, and their Vice President just had her house burned down and they’re looking for fosters to take in animals displaced. The Bastrop County Animal Shelter was evacuated as well and thanks to the awesome folks at Austin Pets Alive and the Austin Humane Society, all the animals were saved and they’re looking for donations and temporary fosters. If you’re in Texas and want to help in some way, check out the Help For Fire Victims Facebook page and keep updated with the news on the Statesman, they’ve been on top of everything. It’s been crazy down here, and today is supposed to be worse. 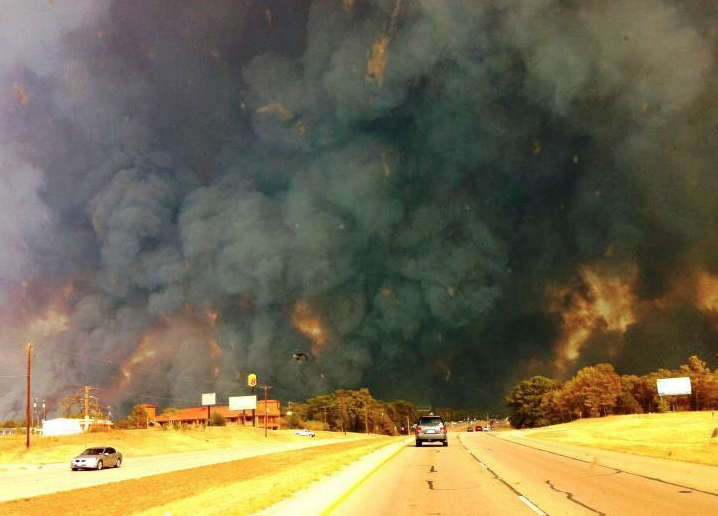 If you haven’t heard, Central Texas is being hit HARD with fires right now. The biggest being the one in Bastrop that has burned up to 25,000 acres since yesterday, jumped the Colorado River twice, and has desecrated more than 300 houses. Over 5,000 people have been evacuated so far, and a mother and her 18-month-old child were killed. The winds from the recent hurricane aren’t helping. You can check out the placement of all fire activity on this page. Ash and I are in east Austin and while the fires are supposedly moving away from us, we’ve still come up with our evacuation plan (packing up 20 animals is no easy feat). Standing outside in our front yard, the smell of smoke is strong. It’s scary. If we didn’t have so many fosters already, I know we’d both be at the shelter taking in animals right now. I’ll be continually nagging friends all day to make sure they’re okay. Please send good thoughts, positive vibes, and lots of rain. I kind of have all sorts of love for Kickstarter.com. If you aren’t familiar with it, check it out. It’s a site that enables creatives to create fundraisers for projects of all sorts – from art to dance to tech to food to flying pigs to the moon and back. It is a fantastic tool to get noticed and, of course, raise money for projects that better the world. Which is why I’m introducing a new column here at Snailbird: Kickstarter Favorites! Paul Keskey is a New York painter with a passionate dream to introduce the world to Chrysalies, sentient beings that often mistaken for the more commonly known faery. 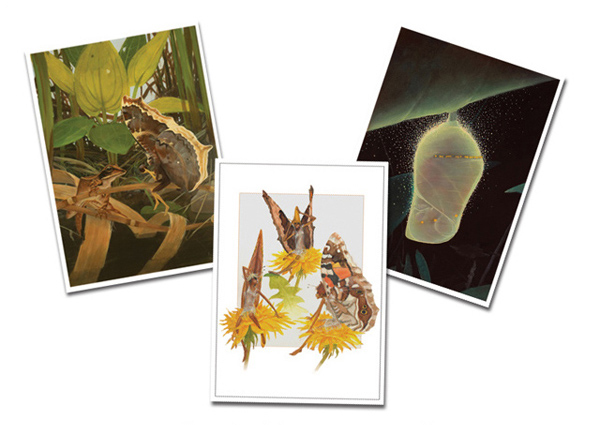 Using his subtle paintings and carefully written observations, Paul has created a field guide to the natural world of this little creature. 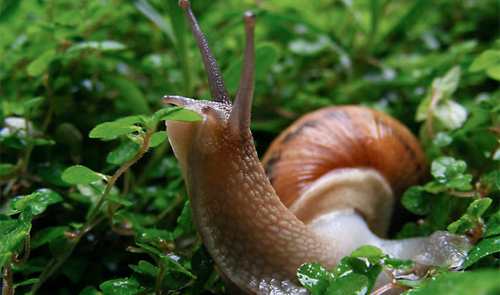 In order to bring his dream to reality, he has utilized Kickstarter to get the word out about it: A Field Guide to Chrysalies, They’re Not Faeries. As of this post, Paul has a total of $4,400 and needs to reach $10,500 in seven days, September 11th. I believe it’s doable. And Kickstarter makes it easy for you to help. All you have to do is make a pledge to donate any amount of money to help him reach his goal. You don’t have to pledge for nothing – Paul has some awesome incentives for different levels of pledgers, which you can check out on the kickstarter page. You could get postcards, prints, hand-drawn thank you cards, or even a copy of the very book Paul is trying to make. And everything Paul makes is a work of art. You can check out his personal art gallery page at MorningMist Studios. Oh, and if you haven’t gotten enough of Paul, check out the interview I did with him for Fuel Your Illustration. Why else should you pledge to donate for Paul’s project? Well one, it’s just plain beautiful and I think everyone would benefit for having such a gorgeous book in their house. But another good reason is a simple one: to support Paul and his family. Living in New York means that his family was located in the path of the recent Hurricane Irene. His neighborhood, and his yard, was flooded, and I know that making his goal would be one hell of an awesome way to make his week better as he deals with all the weather issues. This morning he sent me these pictures of what he’s working with right now and it made me want to help him even more. Paul is awesome and he’s got an amazing talent to bring fantasy to life. His paintings are right out of my own childhood. Why wouldn’t you want to donate to his cause? 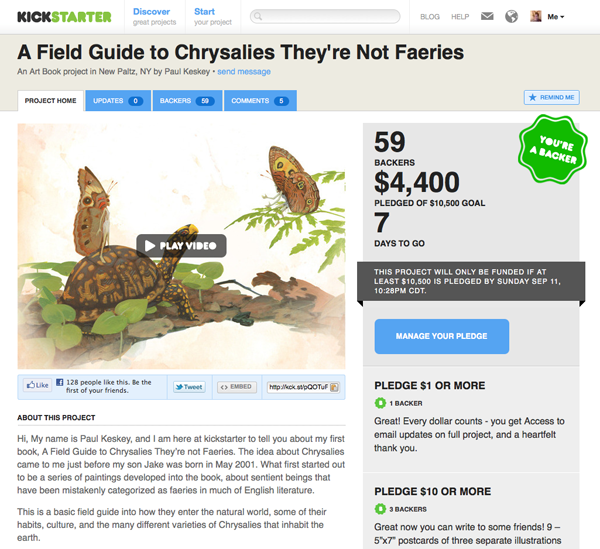 Pledge your support and donate to A Field Guide to Chrysalies, They’re not Faeries!